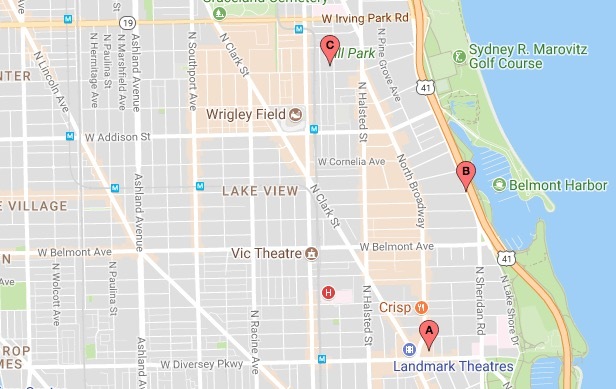 A group of young men has robbed at least three women in Lakeview East since Sunday evening. All of the attacks have occurred between 7 p.m and 9:30 p.m.
• Around 8:15 p.m., a group of three offenders attacked a woman and took her purse in the 500 block of West Surf. • At 9 p.m., a woman was robbed by three offenders near Roscoe and Lake Shore Drive. The robbers wrestled away the woman’s computer tote bag and were last seen running westbound in the 400 block of West Roscoe. Around 7:20 Sunday evening, a woman told police that two offenders approached her in the 900 block of West Grace and poked a chrome handgun into her stomach. They took the woman’s purse and ran eastbound on Grace toward Broadway. Monday’s offenders were described as three black men in their late teens or early 20’s who stand 5’10” to 6-feet tall. All are slim and were last seen wearing dark-colored hoodies or sweaters. Sunday’s robbers were said to be black men between 25- and 30-years-old who standa bout 5’10” tall and weigh about 140 pounds. One wore a black hoodie, and the other wore a black hoodie with a gray jacket.